Click the photos to view each of the bird-themed sun catchers up-close. 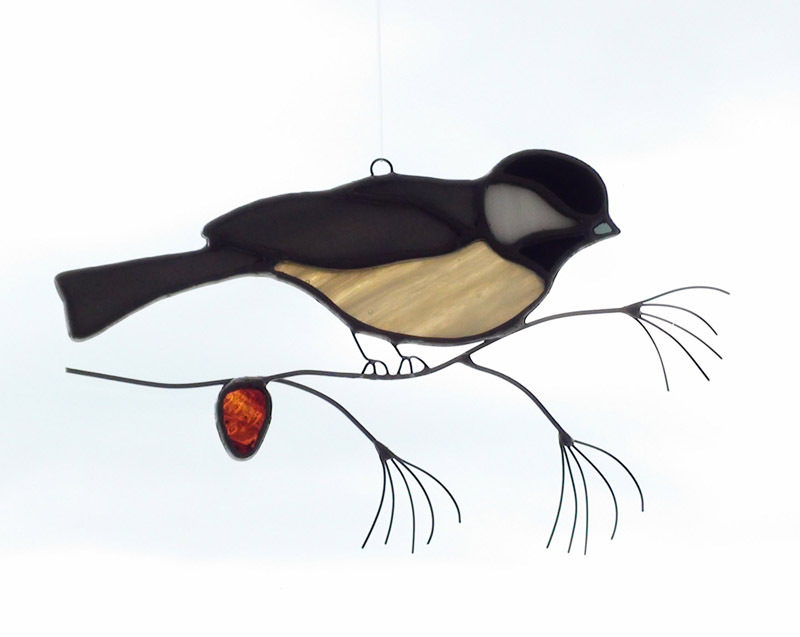 Description: Originally designed in 1985, this Black Capped Chickadee sitting on wire pine branches is the first in a long line of realistic stained glass birds, which have become the most requested designs by Julie Bubolz. Surrounded by an 7.25 inch clear "Jack Frost" textured glass border, the background is left open to create a natural feel. The neutral black, white, gray and amber colors of the bird have a peaceful, calming effect and work well with any decor. This Chickadee Circle has become Imagination Creation's favorite bird item. Matching Chickadee themed pieces are available in other listings under Sun Catchers and Candle Holders. 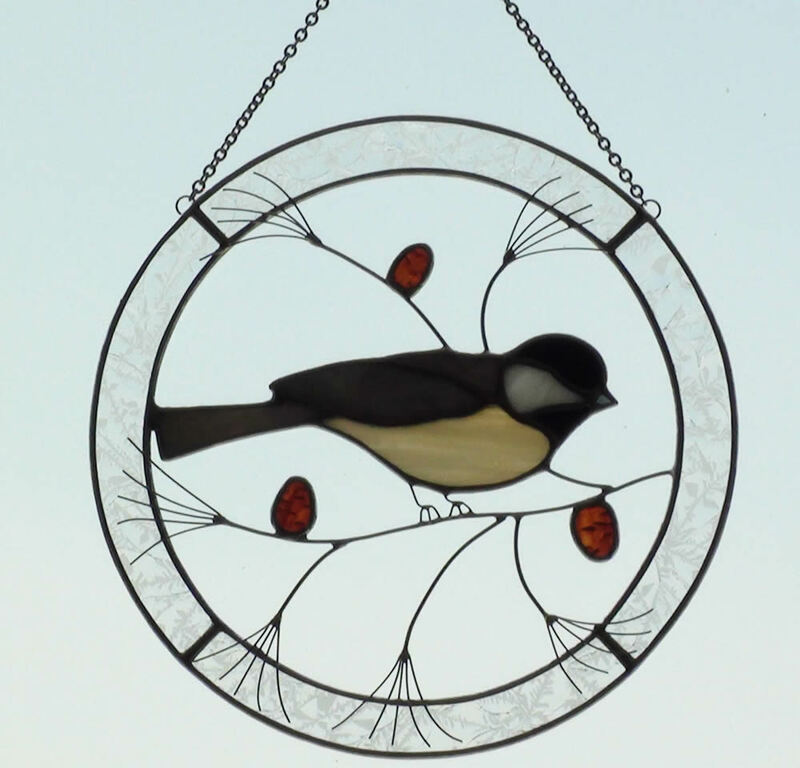 DESCRIPTION: This friendly black capped chickadee is made of black, white and pale amber stained glass. Nestled on a pine branch made of wire with a brown cut glass pine cone attached, it measures approximately 4 inches high by 6.5 inches wide depending on the randomly placed branches. It is a very light weight sun catcher, using the foil method of construction. Each piece of glass is wrapped with a piece of foil tape, then all of the seam lines and the outer border are soldered together. Even though it is light, it is a very sturdy piece. Other matching chickadee themed items can be found in separate listings. DESCRIPTION: A black capped chickadee holding a red berry in it’s beak, while perched on a wire branch with green leaves and a red berry cluster. 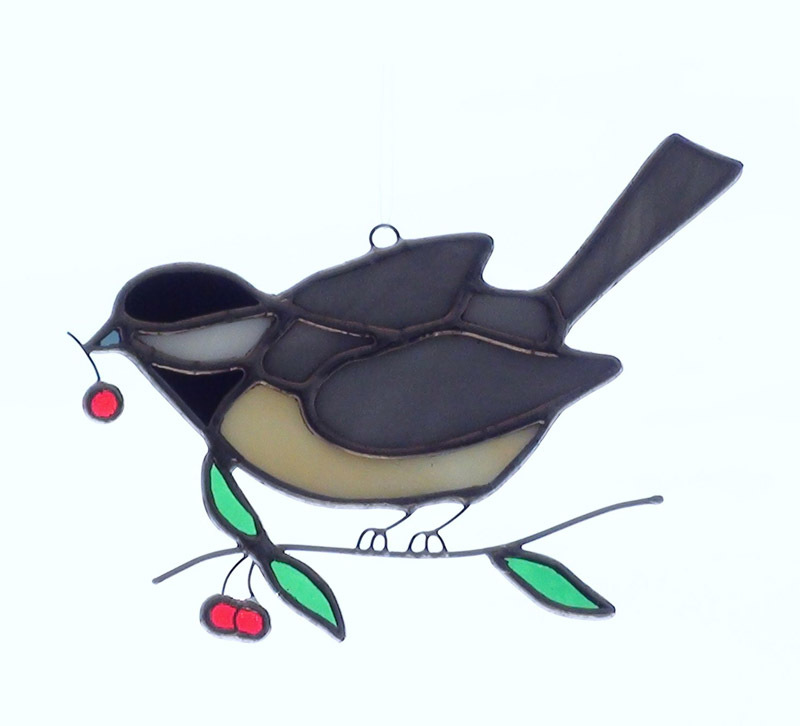 This black and white chickadee with an amber belly is light weight and sturdily constructed using the foil method. It approximately measures 5 inches by 3.5 inches. Other chickadee items can be found in separate listings to create an attractive ensemble. 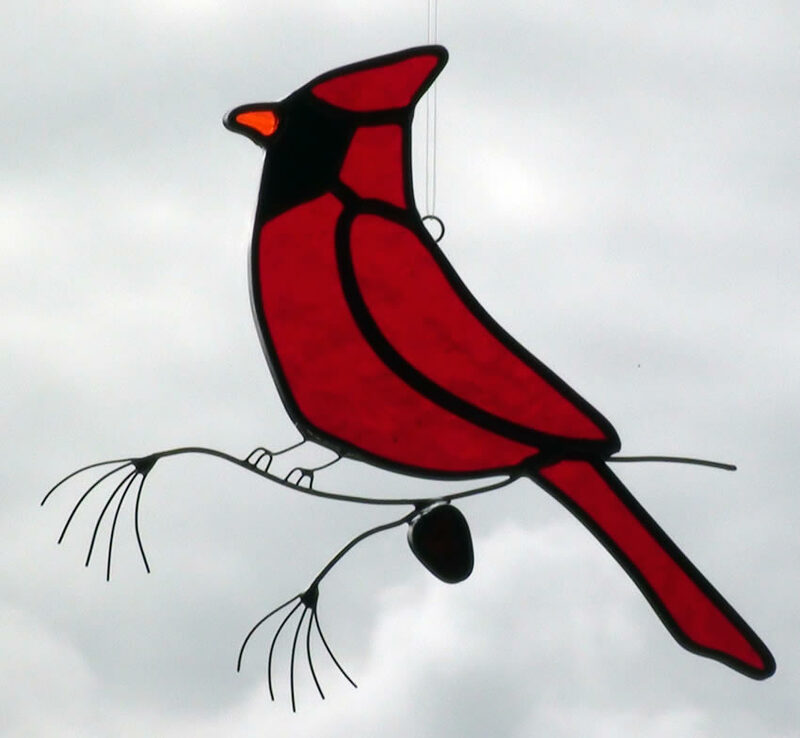 Description: The red cardinal is a favorite of both bird lovers and stained glass enthusiasts. Sitting on a pine branch made out of wire with a brown glass pine cone, this cardinal sun catcher measures 6.5 inches high x 7 inches wide. The sun catcher in this listing is made using lead came. A more delicate version constructed using the foil method is available by special order. Other cardinal themed items can be found in separate listings. 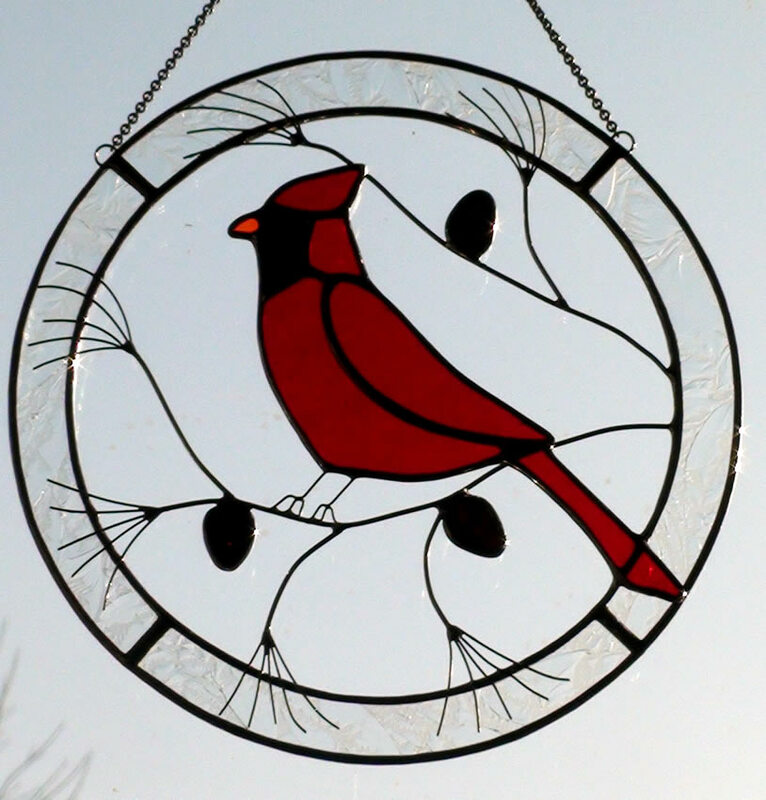 Description: A circular sun catcher highlighting a red cardinal is sure to catch the eye of both bird lovers and stained glass lovers alike. The 7.25 inch diameter, circular border is made from clear glass that has a "Jack Frost" pattern. The cardinal sits on pine branches made from wire with brown glass pine cones scattered around the circle. The background is open to create a natural feel to this piece. Other cardinal items are available creating a nice decorating ensemble. These companion pieces can be found in separate listings under Sun Catchers and Candle Holders.